Unemployment is the main reason why there is so much poverty all around. Anybody can become a victim regardless of how well educated they are. Families are falling apart because getting a job is not so easy anymore. Seeing your brother and boyfriend without a job will possibly push you to the edge. But you have to keep yourself calm and collected to help your brother or boyfriend get back on their feet. Here are a few useful things you can do to give them positive reinforcement. How to Help Unemployed Brother? Firstly a brother always has a chip on both shoulders till he can get a job and support the family. Secondly, getting a job is not as easy anymore. So this can make things hard for your brother. This is quite a sentimental topic especially if all his friends are getting settled one by one. Also being a son is followed by a life of hefty responsibilities. So do not even by accident talk about his inactivity in any way. Even if you were subtly trying to make conversation, things are surely going to heat up. Patiently listen to what he has to say. He might be having problems that he cannot share with just anybody. In that case you might just be the person he can trustingly look to for advice. By having a heart to heart conversation you will not only gain his trust but also boost his confidence by leaps and bounds. Men are just as sensitive as women. Not being concerned for them because stereotypically men are to be strong can lead to serious health related problems in him. Lastly, understanding his current mental situation is important if you are to successfully help him get back on his feet. Accompanying your brother in filling up forms or doing something that will help his ways is definitely going to cheer him up. Men can sometimes be really egotistical. They would prefer to die alone than ask for help. So as his sister you will need to see through his insecurities. Once he has let his guard down you can share your ideas about how you want to help him. But do not make it look like you are offering pity because that will mispresent your intentions. Since it is a sentimental issue, things would not take time to get worse. The first and foremost thing an unemployed brother wants is his confidence back. But you cannot expect him to just come to you with his tale of how mean and unjust the world has been to him. He is still and always going to be your brother. So do not care much for his obstinacy at the time. Try warming up to him by spending some time telling stories related to childhood. It will at least give him the feeling that he still has you, even if he is not having the best time of his life. Try to help him regain his confidence so that he can start working hard for job opportunities without thinking back on time. It will be hard for your brother to express what he wants if he is depressed about not having a job. As a sister your role would be to look after what he needs. You may even have to anticipate his needs because he might not always be in the mood to speak up properly. This is common for an unemployed person. They think that they cannot possibly hope to waste any more money than they can earn. Moreover it is not possible to ask for money from parents when you are old enough to be working yourself. Always be positive around your brother. Do not confuse him with your own problems. Moreover, try not to be upset about anything in front of him. Seeing you in problems is only going to fluster him up more. Instead, try to divert his mind from feeling inept. Try to think as positively as you can to help him stay focused on his goal. Make plans with other people who are important to him to cheer him up. But amidst all the fun keep reminding him of what he needs to do to find work. Thus, positivity will not only bring out the best in him, but will also keep him on his toes. If your brother has recently lost his job then he is probably used to the way the world works. You will just have to help him on his way join the dots till he locates a new and suitable job. He probably knows what he has to do and you will just have to give a boost to his esteem to make things seem easier. Do not discuss how he lost his job and make sure that nobody strikes the wrong cord. Talking about a lost case is only going to enrage him. Just be there for him as how you would expect him to be there for you, if needs be. Not being able to find a job when you are of certain age can be really frustrating for both men and women. However, men handle things differently from women. And it is unfair to think that men who break down easily are weak. Nervousness can take a toll on anyone irrespective of gender. 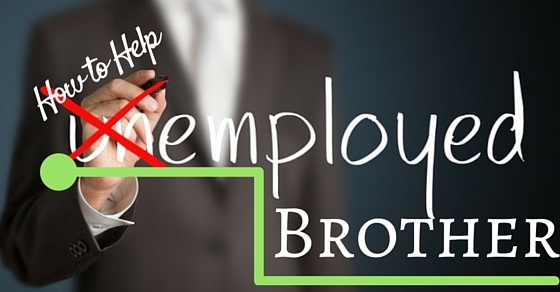 Do not let your brother lose heart if he has not been able to get a job yet. You can bring to his notice the classifieds for a larger variety of options to choose from. That way he will never think that he can run out of options. You can also help him by informing him about the upcoming job exams or recruitments. Doing so would cover all the vital prospects he otherwise would have missed out. Brothers have a habit of brimming with self-confidence. So many a time they think that they can get through exams without much preparation which leads to disappointment. This is a tragic flaw in many people. While it is true that not all men and women are the same and some are smarter than the other, some people despite how confident they are, need help. Taking tutorial or professional help is nothing to be ashamed of. But you have to get your brother to understand this without hurting his feelings. How to Help Unemployed Boyfriend? Just as how two souls are never alike every boyfriend has a different mentality than another. He might or might not want you spending time with him when he does not have a job. Since it is a very despairing situation you cannot force yourself on him like other times. You will have to be extra sensitive to his needs of privacy. There will be problems if you think that he deliberately does not want you with him. It is not that your company will make him worse. It is just that sometimes men like to be alone to cope with things in their own way. I am sure you have heard of the age old adage – the easiest way to a man’s heart is through his stomach. This is a time tested and proven way of making sure that your beloved gets his heart’s fill. If cooking does not come easily to you then you can try making something that is not much of a hassle to make. There are many ready made packaged food you can buy from. Anyway, showing that you care enough to make an effort to cook will do much more to win his confidence. Needless to say that if you already love to cook this is not going to be a problem. Go out with him when you can. Be it for a short walk or to lunch on a weekday. Also you can turn the prospect of meeting you to a sort of game where he has to work day and night to realize his dreams to finally get to spend some quality time with you as reward. Guys normally like challenge. So you can throw him a bone and see where it take him. This is a good way to keep him motivated without losing the essence of fun. Taking care of your boyfriend emotionally is just as important as anything else that you expect may help him. Without a job your boyfriend is going to be very vulnerable. The best is to offer him your support. You can also make him feel how important he is to you and that you are going to stay by his side through thick and thin. You can undoubtedly become his philosophical guide too. Try and make him understand how the world works in a mysterious way and that he would get a job when the time is right and ripe. Do not feed him lies. Be as honest as possible without being brutal. This is important for pointing out the flaws that might be keeping him from triumphing the interview. There can be many things they might be doing wrong. Spend time with him to truly come to terms with his inner nature. See if the way he approaches his practical life is doing more harm than good. Always try to understand what your boyfriend is trying to do before you give your opinion. Do not be hastily eager to dump your opinion about the matter on him. First see if there is anything wrong at all in the way undertakes things. Things are not going to get any better if the only thing you want to concentrate on is setting him straight. It is a different kind of trust entirely that I am talking about. It is the sort of trust that come when you put blind faith into believing that your boyfriend who you care so much about is going to make his dreams come true. And building this trust psychologically prompts your boyfriend to be brave in the face of whatever comes. Moreover, he will put his guard down when he is assured that you cannot possibly say or do anything to belittle him. While he is still preparing hard for his dream job you can help him look for something menial to do to make both ends meet. Chances are that your boyfriend is not living with his parents. So he has to find work for pocket money while he is still unemployed. For this he will need all the help he can get in spreading the words and as proven two pairs of hands are always better than one. The worst way you can treat your boyfriend in is by showing a lack of respect. This is reason enough for him to rub cold shoulders with you. No one wants to be demeaned when they are not exactly in the position they thought they would be in. Do not blame your boyfriend if he has lost his job or still struggling to get one. Instead help him because that is what supporting each other truly means. So these are ways in which you can help your brother or boyfriend with individual life situations. The above mentioned points are more or less the same for all brothers and boyfriends. Other than that, you can handle the little bit of exclusivity that varies from one person to the other.